We will ship all orders above 150 € for FREE* !!! You can see the free shipping policy in detail below. Even if the shipment is not free we will give you the best price possible. ** All prices are shown in Euro. For conversion, we recommend using a Currency Converter. *** Any import duties, taxes or brokerage fees due at the time of delivery are the sole responsibility of the receiving customer. We ship orders out as soon as possible, but this will not always be the same day as your order. In general, for items in stock we usually process and ship them the same day if the order is placed before 1pm local time otherwise they will be shipped the next business day. For orders placed with Courier Service before 7pm local time, they will also be shipped the same business day. In any case if the dispatch time is different than the usual, you will be notified via email or via phone. If we anticipate a longer lead time, it will be noted in the item description. In case your order is not in stock we will give you an estimated shipping time by a follow-up email. You should receive an email confirming your order shortly after you’ve placed it. If you don’t receive that email, please check your spam folder and see if you can locate it. This is especially important because, if you haven’t received the order confirmation email, you also won’t receive the email with your shipment notification and tracking information. When your order gets a tracking number you will receive an SMS with the tracking number (only if you entered your mobile phone when you registered). You can also check your order status in real time by visiting https://trace.tpl.one and providing your transaction ID. 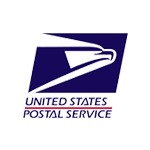 As a shipping service we use the global postal service network. We ship all orders with a tracking number and signed for. For customers that need their parts urgently we offer UPS and DHL Courier Service. UPS and DHL are using their global network to deliver on time for your needs the products ordered. This service is optional and it comes with an extra charge. If you have any questions about the lead time on a specific item, please contact us with your questions. All items with a value of more than 50€ are shipped signature required if possible; please plan accordingly. Please contact us as soon as possible and be sure to include your order number (Transaction ID). Please note that, in this case, you will be accepting responsibility if anything were to happen to the package. There are a few things to be aware of, however: you, the buyer, are responsible for any VAT, tariff, duty, taxes, handling fees, customs clearance charges, etc. required by your country for importing consumer goods. Please do your research so you’re ready to get your package cleared through customs, and have an idea of what the additional cost will be. * Due to the European embargo on Russia we cannot, for the time being, ship to Russia any orders. If you have backordered items in your cart at checkout, those items will not be shipped to you until the item(s) are in stock and available to ship. During the checkout process, you will be able to select if you want all of your items to be shipped together or separate. You will be able to see expected ship dates for backordered items, but these dates are subject to change. You will not be charged additional freight for backordered items that do not ship with your original order. Shipping fees are determined by the merchandise total of the order and the selected carrier service. Shipping charges vary depending on the package size, weight, destination and shipping method. International Shipping: Rates are calculated based on a number of factors, including desired service level, the weight of the item, and the cost of shipping and handling to the destination country/region. Want to check shipping charges before making a purchase? Add items to your cart and click the "check out" button. Don't worry, you will not be charged for an order until you submit your credit card information! 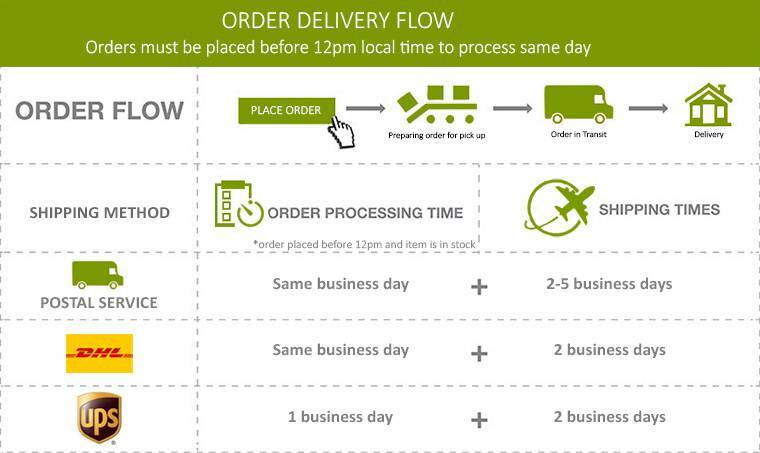 Depending on the shipping method you choose the delivery time varies. We can guaranty the dispatch time but the delivery date depends on the shipping method you choose. TPL is not responsible for a possible delay on delivery. You can trace the status of your order via https://trace.tpl.one by using your transaction ID or with the tracking number provided via the postal service website. The delivery time of the Standard services might take longer on holidays. Any delay on Customs cannot be calculated.